Whitney Young at the White House. 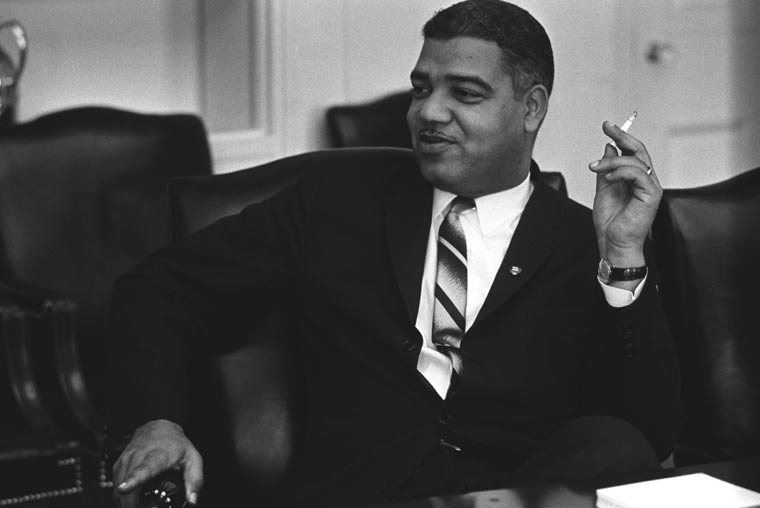 Whitney Moore Young, Jr., was the son of a Kentucky educator. He graduated from Kentucky State College at 18 and became a high school teacher and coach. From 1942 to 1944, while in the U.S. Army, he studied engineering at the Massachusetts Institute of Technology. After his discharge, he received an MSW from the University of Minnesota (1947) and began to work with the Urban League in Minnesota . He became executive secretary of the Urban League in Omaha , Nebraska (1950), taught social work at the University of Nebraska and Creighton University , and became dean of the Atlanta University School of Social Work (1954). In 1961 Young was appointed executive director of the National Urban League, remaining there until his death. (He drowned during a visit to Nigeria ). He became president of the National Conference on Social Welfare in 1965 and president of NASW in 1969. Young was elected a NASW Social Work Pioneer in 1993. A noted civil rights leader and statesman, he worked to eradicate discrimination against blacks and poor people. He served on numerous national boards and advisory committees and received many honorary degrees and awards —including the Medal of Freedom (1969), presented by President Lyndon Johnson—for his outstanding civil rights accomplishments. Young’s books include Beyond Racism: Building an Open Society (1969). Source: Peebles-Wilkins, W. (1995). “Young, Whitney Moore Jr.” In R.L. Edwards (Ed.-in-Chief), Encyclopedia of Social Work (19th ed., Vol. 3, pp. 2618-2619). Washington , DC : NASW Press.